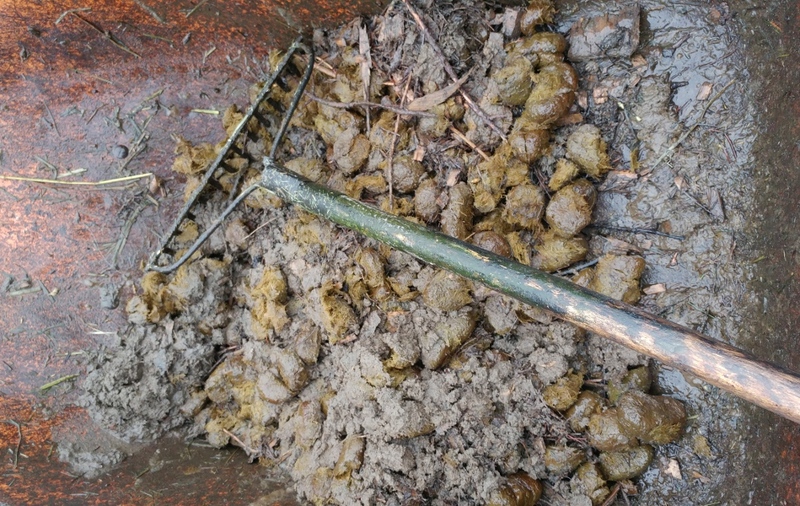 So over the past couple of years, as I’ve been spending time on a farm on the coast where my art studio is, the level of manure I encounter on a daily basis has increased quite a bit. It started with a parrot, and then an appaloosa, and now here we are with three parrots, two horses, seven sheep, a llama, a quail, ten chickens, and one German shepherd. Most of these technically aren’t mine (except the chickens and the dog) but I get to take care of all of them on a daily basis. While I get to do the fun things like feeding and exercising and letting the chickens out to play in the pasture, I also have to take care of the inevitable poop. Sometimes this is as simple as cleaning the newspaper out of a parrot cage. However, one of the messiest and most physically demanding tasks is mucking out the horse shelter, which generally involves taking a wheelbarrow or two of manure and old hay each day over to the orchard to be spread on the ground for the benefit of all the plants. Since there’s nothing new and fragile over there, and the grass is pretty hardy, it can age in situ and within a few months it’s a pretty decent fertilizer for the ground. 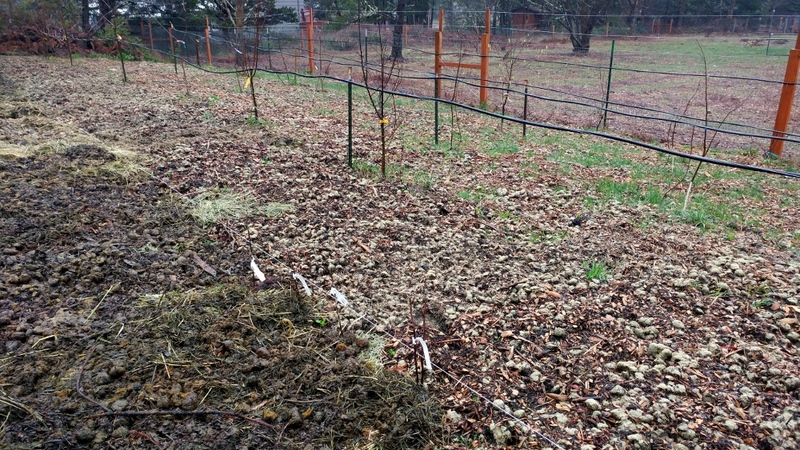 This makes it more efficient than hauling it to a composting area, and then spreading it out in the orchard. It also maximizes the amount of nutrients going to that particular land. See, since the farm is right on the coast, the soil is sandy. And in fact the orchard is on the berm of an old railroad that used to run all the way up the peninsula along what was the beach a century or so ago. When jetties were put in at the mouth of the river, they stopped the flow of sand along the coast, and it began to back up. This has since added several hundred yards of ground to the west side of the peninsula; pretty much everything west of the barn was covered in water not too long ago. So the soil has barely had time to even think of a humus layer, let alone build an appreciable layer thereof. The native plants, like shore pine and common foxglove, have evolved to survive on poor soil, and are some of the first plants to move out onto new land once the grasses have had their say for a while. Putting manure on the ground, therefore, significantly speeds up the rate at which organic material accumulates; planting nitrogen-fixing plants like clover helps further. You’d think I’d hate hauling manure; it’s literally a dirty job (but someone’s gotta do it) and this time of year when everything is soaked with rain the manure picked up out in the pasture is much heavier. But it’s nowhere near as smelly as you might imagine, and moving it around is good exercise. Moreover, I appreciate the effort I’m putting in to take this lovely compost-to-be that our horses have left behind–literally–and use it to improve the soil for cultivation purposes. Especially during winter, when temperatures are cooler, the manure can decay more slowly so that the nutrients aren’t all lost to rapid microbial activity. How is that not magic? It is literally creating food from waste! No human being could take a wand and wave it an accomplish the same. Yet like photosynthesis and the hydrological cycle, this complicated and necessary ritual goes unnoticed by the majority of people the majority of the time. No wonder I’ve run into so many pagans over the years who complain that the world lacks magic just because we can’t shoot fireballs out of our hands or physically shapeshift or stop a speeding bullet with our thoughts. I think they just aren’t looking hard enough. As I’ve grown older, I’ve approached the concept of magic not as some supernatural force wherein we can make things happen beyond normal human abilities, but as the supremely complicated chemical reactions that are at the heart of how our precious, fragile, life-giving Earth functions at all levels. My world is absolutely full to bursting with magic, with the ancient solar-systemic forces that cause the Earth to rotate to this day, the transformation of sunlight into the sugars that fuel the entire food web via photosynthesis, and the replication of DNA in countless cells of a myriad of living creatures every moment. If I were still the sort of pagan to put stock in spells and rites, I might make something of my daily efforts beyond this. And in fact sometimes I do think about things that are bothering me when I am scooping and cleaning the horses’ leavings; it’s a time when my mind wanders anyway. But I remember that time and effort transform all things, and so I can imagine that when I spread the muck over the ground and leave it to biodegrade, I also leave my worries there to be digested and turned into something more positive and fertile. This doesn’t actually remove the things I worry about from my life, and it doesn’t miraculously cure me of my anxiety. It’s a good mental exercise, and a reminder that in many cases I have the ability to bring forth good things out of an otherwise bad situation if I just put enough work and patience into it. But I don’t see it as some magical rite that changes anything outside my own head, though years ago I might have. 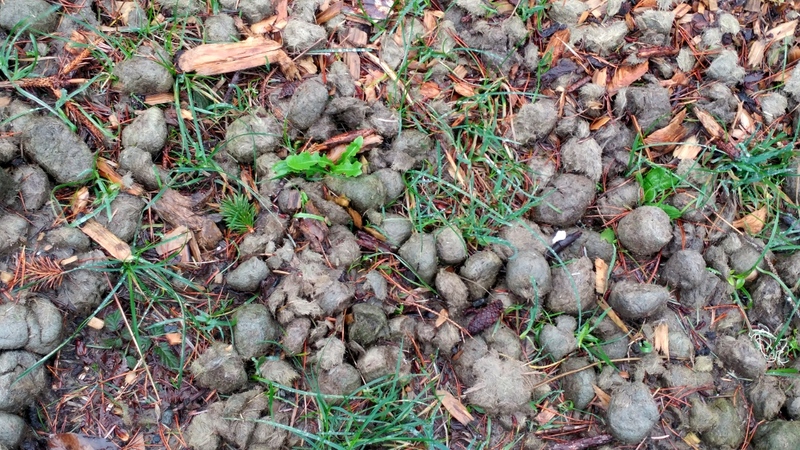 Today, there is magic enough in the manure itself, from the time that the horse’s intestines are drawing the last nutrients they can through their permeable membranes to feed hungry cells, to when flies lay the eggs carrying the next generation in the fresh piles, and finally when the whole mess is spread out by wheelbarrow and raked over sandy soil to be made into a buffet for all sorts of tiny creatures without whom the ecosystem would collapse. It is motion, and transformation, and the passing of life-force from one being to another. Not only grass, but hawksbeard, trailing blackberry and other plants are already finding a place among what will nourish them for generations. The additional nutrients will also host a greater diversity of fungi, bacteria and other tiny beings, as well as insects and other small arthropods, plus the birds and other animals that eat them–and so on. I am content with this sort of magic, natural and measurable and infinitely replicable–and not at all anthropocentric. Not that I’m entirely uninvolved; I find peace with the change I make in the world by moving nutrients from one place to another so that the second place may be more suitable for fruit and nut trees, and berry vines, and who knows what else? I experience awe and wonder at knowing, at least from a layperson’s view, how this cycle of decay and renewal works, and how it doesn’t even really need my participation to keep doing its thing twenty-four hours a day. I am bringing forth a more fertile micro-reality in accordance with my Will, though with the understanding that there are plenty of factors–weather, unhappy microbes, me having a cold and being unable to move manure that day–that could affect the outcome in spite of my best efforts. And so, dear reader, there’s a good chance that while you finish this post, I am out on the land with a pitchfork and wheelbarrow, creating fertile magic with the help of microbes and manure. Did you enjoy this blog post? Consider picking up a copy of my book, Nature Spirituality From the Ground Up! It’s a guide to connecting with your bioregion on both spiritual and practical levels.